Earthquakes have disastrous effects and they impact people all over the world, but what causes them? Learn how to create a paper model that demonstrates the different kinds of faults that cause earthquakes. This model comes from USGS’s Earth Science Week and they created a very detailed guide that you can use in your own classroom. A fault is a fracture or break in the Earth’s surface in which rocks on either side of the fault have moved past each other. There are three basic types of faults that lead to the development of earthquakes. Each type of fault refers to the motion of the rocks and the direction of the movement occurring. USGS has a great visual glossary that you can refer to for more detailed information. In order to understand the movements that occur in a fault, it is important to understand the components of a fault. Each fault has what is called a “hanging wall” and a “foot wall”. These walls only form during normal or reverse faults. The line surrounded by arrows is the fault plane. The area above the fault plane is going to be the hanging wall, while the area below it is the footwall. The first kind of fault is a normal fault. Normal faults form when the hanging wall drops down relative to the footwall. A reverse fault is, well, the opposite of a normal fault. 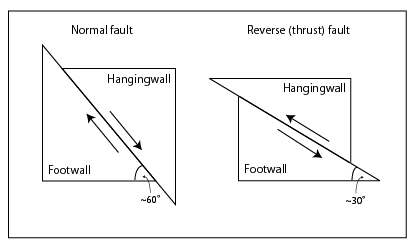 A reverse fault forms when the hanging wall shift upwards over the footwall. These two faults move vertically in relation to one another. A strike-slip fault moves horizontally. With these faults, there are no hanging or foot walls, and the sides are carried past one another. First, students should begin with coloring in the sections of the model according to the coloring key. Once they have finished coloring in the model, they should cut out the model along the outline. Leave the small grey flaps on the side to make it easier to stand up on its own. Fold down the rock layers along the dashed line in the middle of the fault to create a box. Each layer should line up with one another on each side. Once it is folded down, cut along the dashed line to create the “crack” in the earth. There are instructions to create different kinds of faults that I will include here. USGS’s Earth Science Week created a very in-depth teaching guide that you can refer to for more detailed information. Locate points A and B on your model. Move point B so that it is next to Point A. Observe your model from the side (its cross-section). Have students draw the normal fault as represented by the model they have just constructed. Locate points C and D on your model. Move Point C next to point D. Observe the cross-section of your model. Have students draw the thrust fault as represented by the model they have just constructed. Locate points F and G on your model. Move the pieces of the model so that point F is next to point G. Have students draw an overhead view of the surface as it looks after movement along the fault.